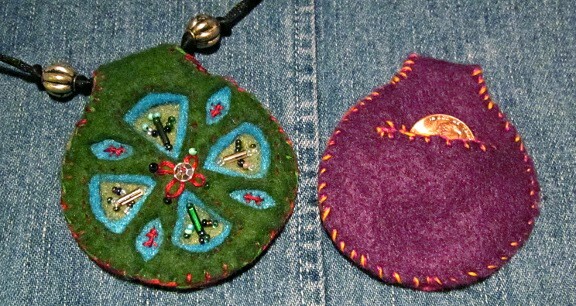 Circular “Earth Mandala” pendant, with secret pocket, choice of colors, 2 1/2″ across. Go Here to view and purchase items such as pendants, Wristicuff wrist wallets, card wallets, collectible & vintage items, and more on my Etsy storefront. Purple Techno Starburst, acrylic/metallic pen/permanent marker/mirror embroidery on canvas, 9 x 12″, 2005. Artist trade. Go Here to visit me on ArtFlakes, where you can purchase high quality prints, greeting cards, and other archival art products featuring my drawings, paintings & 2-D mixed media work.